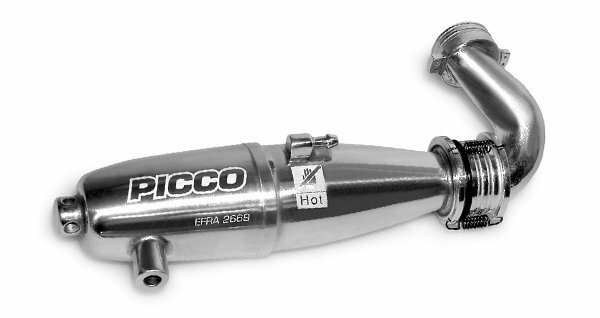 All PICCO EXHAUST SYSTEMS are EFRA homologated and designed to optimize the performance of your Picco made engine. We strongly recommend to use an original Picco exhaust with your engine. Durability and reliability of your power package could be compromised by using a different combination. Made with the finest materials, all PICCO EXHAUST SYSTEMS are 'in-line', where the manifold is connected to muffler with springs. All Picco engines can be supplied combined with its dedicated exhaust system in a special 'nitro-pack' set.